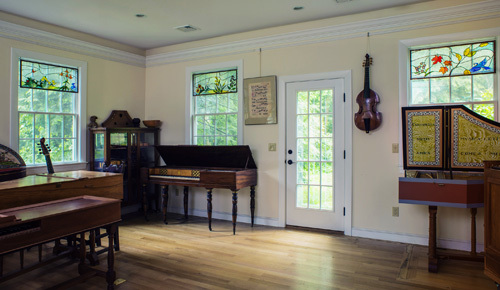 Six panels depicting a year in New England are installed in front of existing sash in the music room of a harpsichord-builder. As he and his wife both play continuo instruments, the panels are united by the bass-line from Marin Marais’ Allemande from Suite in D major, Book 3, etched in the background glass. With good eyesight and lighting conditions, they could actually play the whole piece from their windows. Canada lily, and bellflower, with a monarch butterfly. painted trillium, and a mourning cloak butterfly. EARLY FALL - blanket flower, daisy, goldenrod, aster. blue flag, and wild rose. LATE FALL - aster, maple, beech, and a blue jay.